On the same day that Biram Dah Abeid published from prison [27 April 2016] http://unpo.org/article/19129, his fellow abolitionist activists took to the streets of Berlin to heed his letter’s call to continue their struggle against slavery in Mauritania. 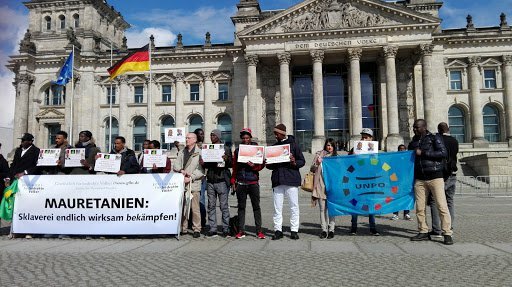 UNPO joined the Society for Threatened Peoples, as well as other activists, to protest in front of the Mauritanian Embassy and the Bundestag respectively, and draw as much attention as possible to the pervasive situation, as well as to protest against Biram's continued detention. Despite the Mauritanian government’s adoption of a roadmap to combat slavery in 2014, disappointingly the barbaric practice remains, with political will to implement the roadmap seemingly lacklustre at best. Furthermore, attention and condemnation of the practice from the international community have been inadequate, leaving the Mauritanian government at liberty to continue its implementation of the Roadmap at a frustratingly slow pace. However, a number of Mauritanian and international NGOs, including UNPO, have been, and continue to be, particularly active in campaigning for this issue, in particular, IRA-Mauritanie (Initiative for the Resurgence of the Abolitionist Movement) whose president Biram Dah Abeid, also a former UNPO Presidency member, together with his deputy Brahim Bilal Ramdhane, have been imprisoned for their activism since 11 November 2014.